Store windows, gas pumps, break rooms, cafeterias, and more. Almost everyone with a smartphone can download a QR Code reader. What are they? It's that black-and-white image you see on the poster to your left. What does it do? It simply contains an address to a website that can be anything from your homepage to a donation page - the latter of which is where the one on the left will take you. It can also generate text, a phone number, or even an SMS. Instead of typing all that information into a smartphone, the readers use the smartphone's camera to decipher the code and offer up a link for you to browse. This is the best QR code generator that I found, and it’s easy to use: http://qrcode.kaywa.com/. Just put in any URL and it creates a QR code immediately. Right click on the QR Code image generated, and you can save it on your computer. Most people can download a QR code reader to their smartphones, but you can also download a version that will turn you laptop’s or desktop camera into a reader. Go here for more information: http://www.dansl.net/blog/?p=256. To download a version to your smartphone, simply go to your marketplace using your smartphone's stored logo and download a QR Code reader. I have a Droid X Motorola, and it has an icon called "Marketplace." That's where I went and searched for the application. Then using my phone's camera, I was able to click "camera" in the application to decipher the website link; and then simply click on it to see where it takes me. This is one of those evolving technologies made possible by a smartphone. It offers much promise as the technology becomes more rapidly developed. If you want to see what a South Korean retailer did with the codes, you can go here: YouTube Video. This may be the new ultimate "donation box" replacement, eliminating lost, stolen and broken donation boxes. It also makes posters possible in airports, subways and other highly trafficked areas. If you like the idea, please donate to The Orphan Foundation, who's PayPal account is located in the poster to the left. 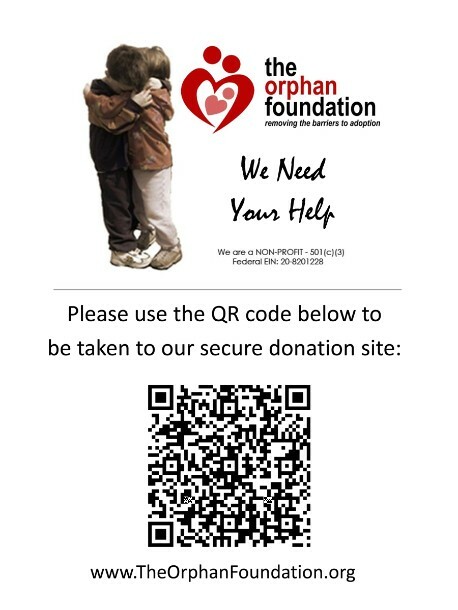 If you'd like to help The Orphan Foundation with it's campaign, please click here: (Poster Link) to download a PDF version for printing. Source of Idea: Joe DiDonato, as adapted from the YouTube video mentioned above. info@FundraisingAlmanac.com.